For Dudeman's birthday, Shrink and I moseyed over to chic Gramercy Park for dinner at The House, an old colonial carriage house that has, for the past several years, been home to an upscale American restaurant. The House has been on my list for a long while and I regret not having gone sooner. It's one of the best restaurants I've eaten in this year. 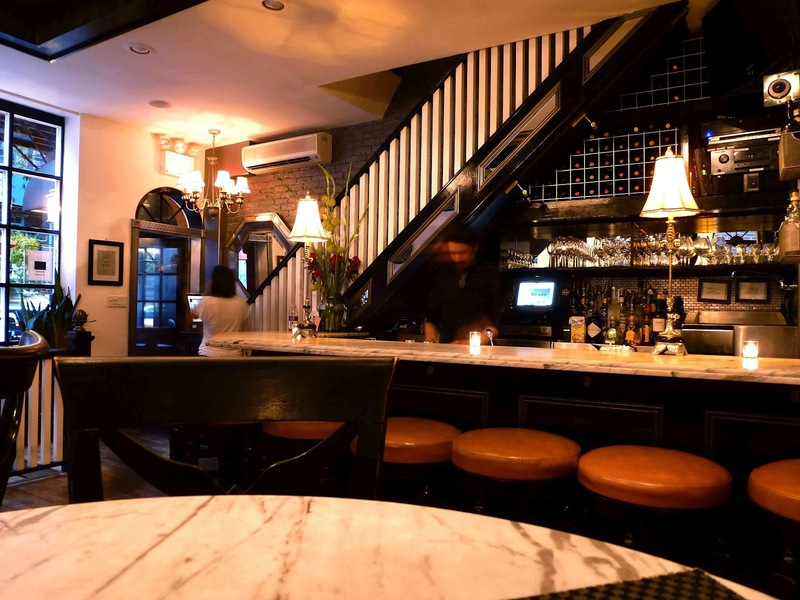 Inside, it's dark and chill and almost speakeasy-like. So already I like it. It's not fancy, but it's better than casual. Still, the atmosphere is extremely relaxed. The volume inside is loud, but not such that you're screaming. It's just loud enough that you can talk without thinking that everyone is listening to you. The service was fantastic. The wait staff was very friendly, none of them hovered around the table but wine glasses still managed to get filled. We arrived at 6:30 on a Saturday night and they were very quiet, but by 8 they were crowded and there was a noticeable energy in the place. I was no longer self conscious enough to keep the flash off on my camera. 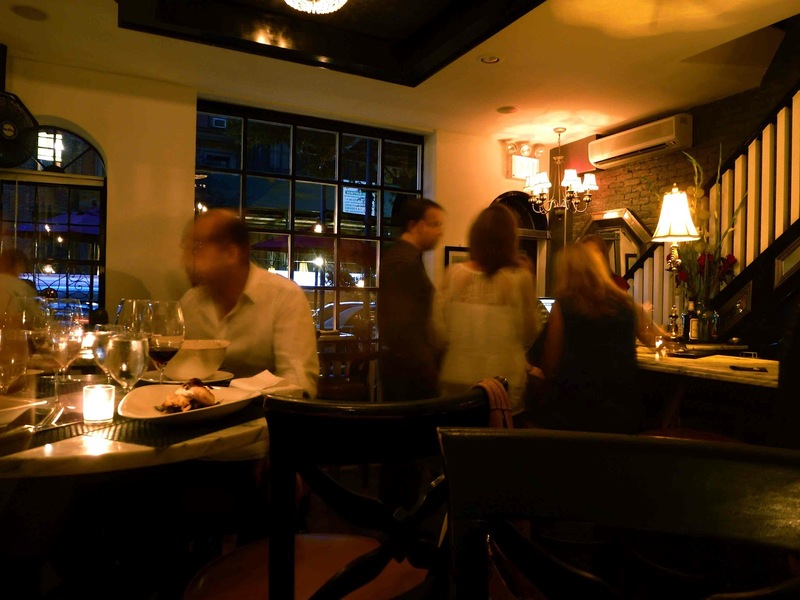 Occasionally places like The House trade atmosphere over their food. 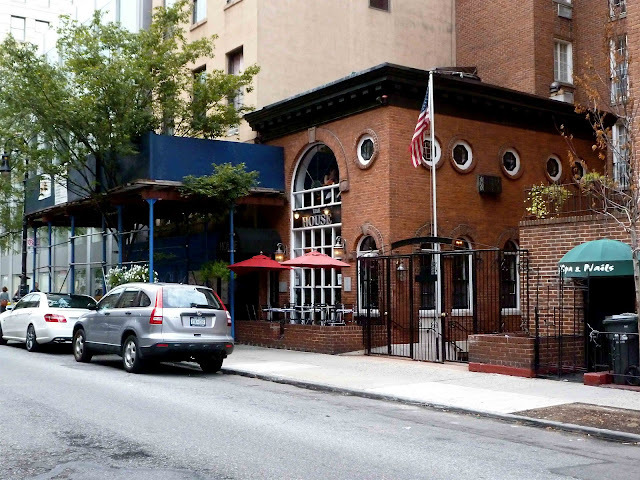 Kingswood in the West Village is a great example. Lots of vibe without much else. The House is more like Fort Defiance. Fun, with good food (and a hefty price tag to back it up). I can safely say that no dish left any of us feeling disappointed. 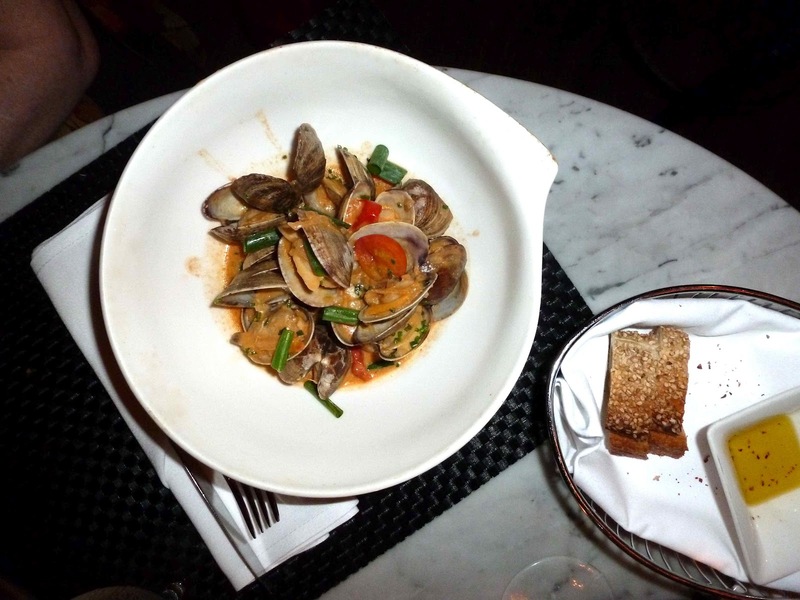 Shrink ordered the Steamed Manila Clams in a coconut red curry broth with lemongrass and ginger. They were fantastic. No grit, no fishiness, very light. In case you worry about heat, the curry sauce was extremely mild and didn't overpower the dish. By the end, when the clams were but empty shells in a neighboring bowl, the sauce was put to good use being sponged up with an extra slice of bread. 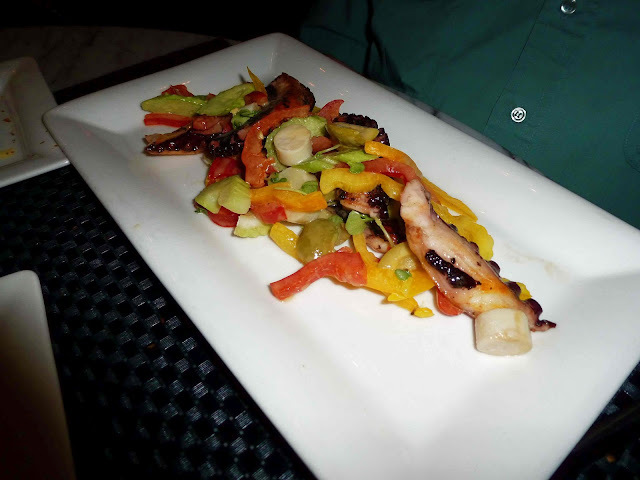 Dudeman ordered the Pulpo a la Plancha, grilled Spanish octopus with tomato, peppers, and hearts of palm in a citrus vinaigrette. The octopus was enjoyed all around but I did find it a bit on the tough side. It was very good, don't get me wrong. I just wish it was more tender. 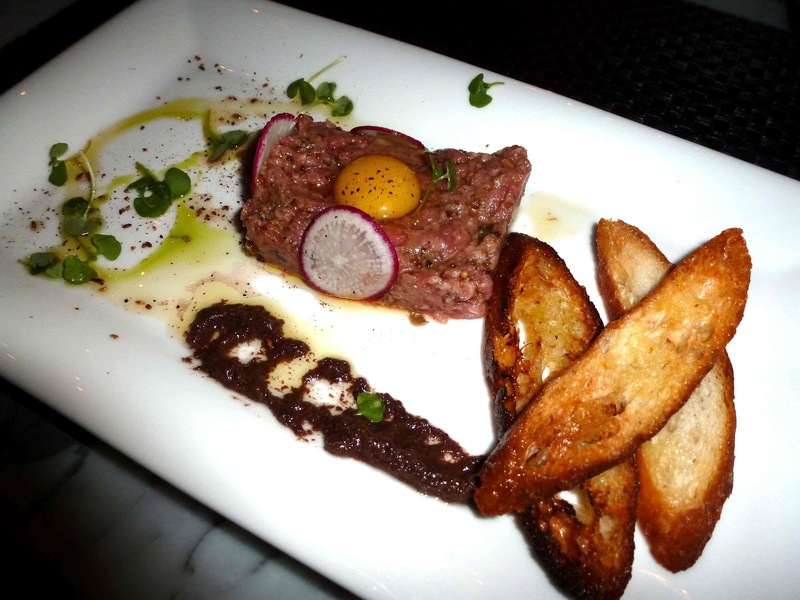 My appetizer was the Steak Tartare, pureed filet mignon with a raw quail egg cracked atop it served with a black olive paste and toast. It was fantastic. Guilt-inducing fantastic. Part of me says you'd have to like raw beef to enjoy this but Shrink tried it and liked it and she usually orders her beef medium well. Dudeman's entree was the Seared Dayboat Sea Scallops, massive scallops tender enough to be cut to in half with a hard stare. They were served under a hazelnut sherry glaze and allegedly there was a side of sweet corn and baby leek. But trust me when I say that it was sheerly fror decoration. He loved it. Shrink chose The House Lasagna. 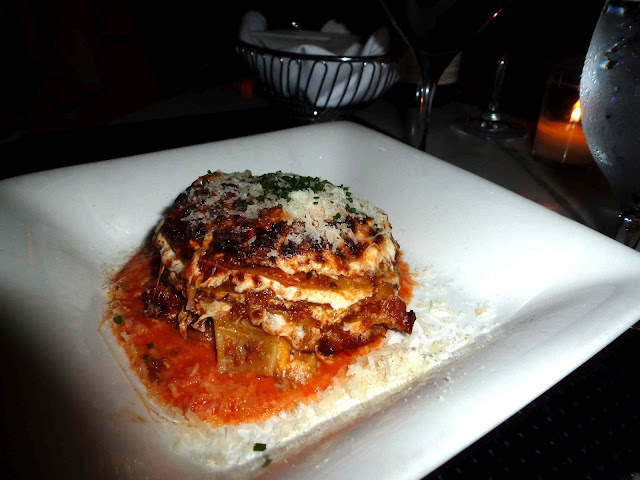 It was one of the best lasagnas that I've ever had, but don't confuse this with the menu's vegetarian option. It's filled with wild boar, beef, and pancetta and now, when I make my own lasagna, I know what to fill it with. 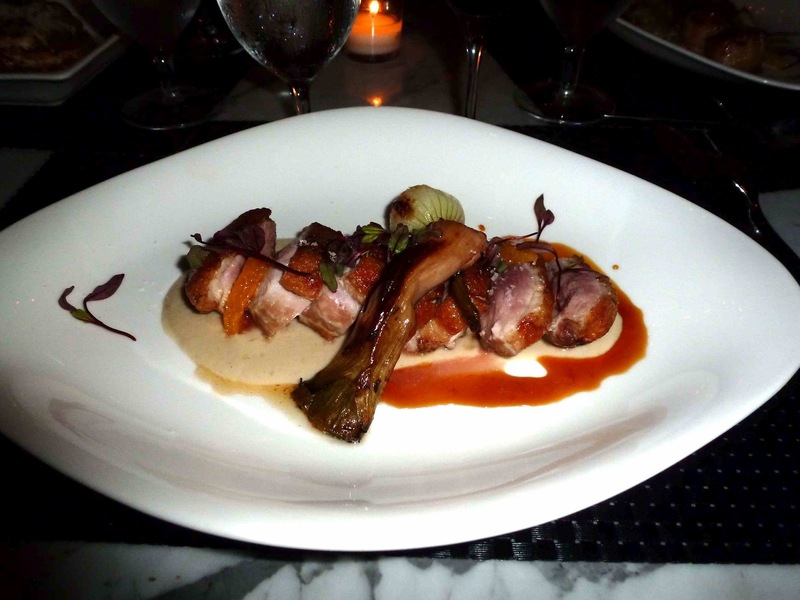 My main course was their Crescent Farms Long Island Duck Breast served medium rare in a clementine glaze with sunchoke puree and scallions. Sunchoke, which is described by some to taste like a cross between water chestnut and ginger, was, in pureed form more like rutabaga or parsnip. There was a bittersweet blandness to it that cut the sweet but exceedingly sour clementine glaze. That makes it sound bad, but don't be confused. It was amazing. The two palates worked very well together and you should definitely order the duck. While all of us ordered coffees, Dudeman skipped dessert. 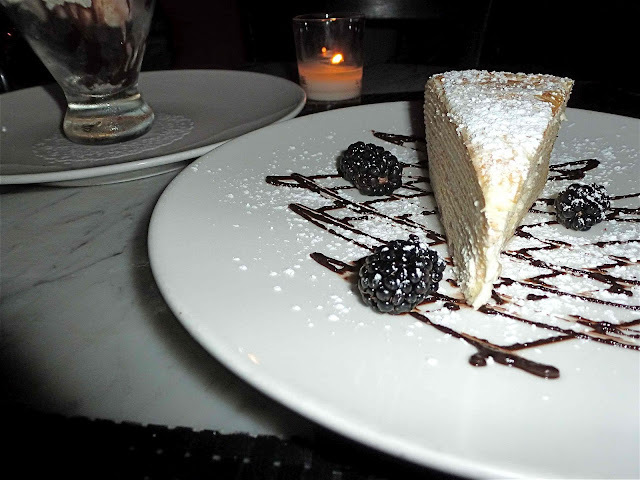 Shrink ordered the Mille Crepes, a cake with dozens of alternating layers of crepe and cream, topped with powdered sugar. Heaven. I ordered an Ice Cream Sunday of some sort which was also delicious. Though you tell me how to screw up ice cream and whipped cream. In the end, it rounded out a great meal in a great space with great atmosphere. 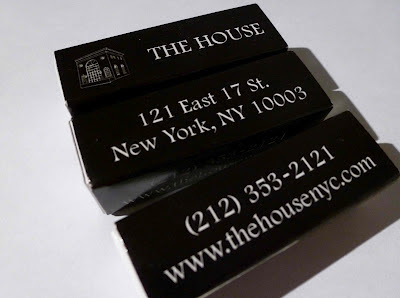 A lot of the reviews that you'll find out there will comment on how romantic The House is. Understandable. I can certainly see a couple spending a romantic time here. But when we went, there were mostly just friends hanging out, eating, talking, and having fun. Never having gone upstairs, I can't speak to the sexual tension of the second floor. But where we were, not so much. That said, definitely go here on a date (especially if you're with someone progressive enough to split the bill). Three appetizers, three entrees, a cocktail, a bottle of wine, two desserts, three coffee, tax, and tip came in just shy of $300.